Death to Grassroots Library Marketing!! Start a Library Franchise! Ok, here it is. I’m absolutely and totally fed up with grassroots library marketing. Now, I’m not saying that some folks aren’t doing awesome things with it, I’m just saying we can do better. I think it’s about time that the library starting some real fundamental advertising and marketing. I mean the kind of awesome commercials you see during the super bowl or at the very least prime time television. Or, at the VERY VERY least, late night or midday commercials. But really, what I would love to see is one of those hour-long infomercials like you see for those products that slice and dice and make some kind of fries. But wait! There’s more! I would also like to see billboards, street signs, signs on buses and popups on the Internet and the whole litany of regular advertising in use by major corporations. Why can’t we do that? Ok, I’ll tell you why. Its because we all work so far apart from each other and our networks aren’t tied together like a franchise where we can do real resource sharing, where our friends groups can work closely together, and where we can share costs on such extreme projects. I think it’s about time that we start these kinds of projects. That we start coming together as a profession to really start a library franchise with a brand name that we can plaster our cities, televisions, and intertubes with. 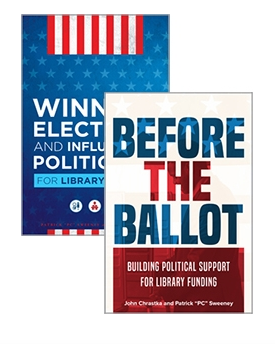 Maybe then we can finally get away from this crap grassroots (read cheap) marketing, start playing with the big boys, and getting the word out to Joe Public about what libraries are and what we have become. While we’re at it…. Can I beg you to please, at the very absolutely total complete least, knock off the eight and a half by eleven colored paper with clipart and comic sans font that so many librarians pass off as adequate marketing? *added* I just recently discovered these library marketing blogs. I was going to write more but these folks pretty much cover it all. I completely agree, though there might be some resistance to this idea simply because of the “We’re nonprofit not corporate” mentality most libraries have. This has been an issue for years with some libraries taking on a more businesslike service model, though not necessarily a businesslike marketing model. The other problem is that marketing smartly requires know-how and money, both things libraries are seriously lacking right now. (Well, okay, more often than right now.) I’d love to see all cliparted Comic Sansed library materials die in a fire but most librarians likely don’t have the time to learn design basics and hey, MS Word is so convenient. Most of us don’t have the money it takes to hire a good marketer or brand builder/manager, which a lot of them really need. This is a thorny problem both because, as you said, we all work apart from each other and we lack the time/money/know-how/etc to effectively do this. However I, for one, would be happy to start by doing away with the Comic Sans and clipart. Several years ago, BALIS (the Bay Area Library & Information System) started a campaign called Free2 (see http://wearefree2.org/). The system paid for the development of the campaign, did bus wraps, put up signs at bus stops, etc. They made materials available. Memberships that get libraries access to the professionally-developed materials were low (max was $500). But libraries didn’t buy into it. Why? I’m familiar with that campaign and really wanted it to succeed. I think (speculation), and Kelley said it above, that libraries just don’t have a strong desire to market their services due to our belief about the structure of our organizations. 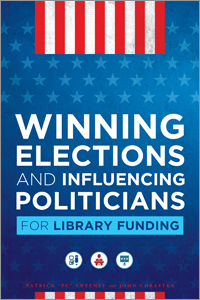 I have yet to see a library budget that has a significant budget set aside for marketing. I have looked closely at quite a few budgets, and I rarely see a line item for marketing, or a line item that would be significant enough to pay for much more than a couple of nicely printed posters once a month or a bunch of 8 1/2 x 11 flyers. If you find some library budget that has a marketing budget that exceeds 1% of their total budget, I would be extremely surprised. *Many companies budget for marketing is around 4-10% and many far exceed even 10%. While we are not a new business, I would like to point that we are offering a wide range of new services and programs and our marketing should reflect that. Maybe then we wouldn’t have to go through things like the whole Seth Godin Affair. How about firing a librarian and hiring an actual PR person (or a librarian with proven PR skills)? It’s kind of a joke how practically every library conference has numerous sessions that give perfectly common sense advice like, oh just off the top of my head, having a contact list, promoting outside of the library, actually talking to patrons about events…why isn’t all of this stuff obvious to people with master’s degree? Starting and maintaining a patron contact list and PR contacts takes five minutes a week (though initial research for the latter may take a bit longer) so time is not an issue (unless a librarian has trouble with basic email functions and Excel, often the case). And I’m not even getting into advocacy here. Thus I’ve concluded that instead of telling clueless librarians the same thing over and over (and over) again, libraries should just fire one librarian and hire a PR person. Problem solved.